The word "Rodeo" embraces the goodwill, joy and down home country spirit I have had the pleasure of being a part of this past year. Beneath the branches of the Professional Rodeo Cowboys Association�s family tree, there are many gifts and blessings to be shared and passed on to future generations. I have seen these values expressed in a hard days work, in good sportsmanship as friends compete together, in the peace we all have felt during rodeo worship and in the eyes of a smiling child enjoying the rodeo experience. I would be honored to enter America�s new millennium as Rodeo�s First Lady. It is my goal to pass on the legacy of rodeo and an enhanced understanding of our Western Heritage to future generations. I would like the opportunity to be a part of Rodeo�s destiny and help open up an understanding and appreciation of our true American treasure "Rodeo�s Present." A quote from former Miss Rodeo America, Brandy DeJongh. A Rodeo Queenship is a most rewarding experiance in life. It is more than sitting on a throne, a horse in this case, projecting a glittering smile. Behind every successful queen is an interested family, good horsemanship instructors, concerned sponsors, and a host of friends and supporters. We are living in a world of competition that does not have room for anyone that is trying to fake their way. A queen is symbolic. It is natural for her to be of a cheerful and friendly personality with a sincere love of people. She must be tolerant and flexible when confronted with confusing situations as well as pleasant and dedicated to upholding a high code of ethics and standards. She is a gracious lady at all times and knows her duties and not only does them well but carries them further with original work. She has discipline, determination, and perseverence, and a sincere desire with much drive to do her job well. Her sportsmanship is unexcelled and she is generous with encouraging words. She is filled to the brim with skills and knowledge of the horse industry and rodeo. And with all this she finds the key words are fun and enjoyment. There must never be a lack of interest or she must never tire of promting her purpose. She must certainly show enthusiasm and must always keeep that determination to work and improve herself. FOR SHE IS A QUEEN AND THAT IS UNIQUE! Why do I want to be a Rodeo Queen? Is it pride, do I just want to be seen? Is it a stepping stone to something better? Or just to put on my resume letter? Do I ride that horse just to be Queen? Do I think, on the horse I look pretty keen? Why do I dress in these western duds? Why do I primp and clean in these suds? I'll tell you why I want to be Queen. I don't go to all this work just to be seen. I dress like a cowgirl just for the look. I love the west and its values I took. My horse is a friend to me. With him my dreams are set free. I train him so we can be one. With him I've shared lots of fun. I like the feeling of being free. Western life suits me to a tee. For in the west I have much pride. For talking about cowboys is what I do best. I'd love to travel and meet new friends. I'm not interested in the preppie trends. I'll tell how rodeo got its start. How cowboys need lots of heart. And how the contractors care for thier stock. I won't be seen with a long frown. And that's one job I'll never shirk. To wish I was still on that Queen title track. For cowboys, the rodeo and God up above. As I circle the arena representing the land of the free. And the parent sitting there only able to wait. Who will give the queen a little fun-loving flack. Never recognized for her glories. until he goes to his grave. It's the child who asks shyly or politely to get my autograph. The security gaurd who hugs me with a laugh. that remind me the world is still good. Who will never receive that applauding clap. Ever since I can remember I 've loved horses. � Out of this love for horses grew a love of Rodeo. �I also have always had this fascination with things that sparkled and glittered. �The sight of a rodeo queen all decked out in sequins, with that tiara and satin title, galloping around an arena has always been, to me, a breath taking sight to behold. �I wanted to be that rodeo queen. �And now my dream has been fulfilled. I realized this as I carried Old Glory around the arena at the Powder River Roundup. A pro rodeo held in Gillette, WY in August of 2002. 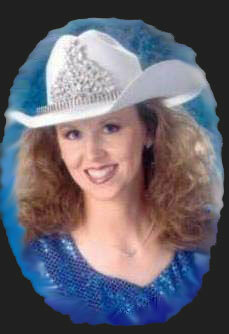 I have held two rodeo queen titles and I competed for the pretigious title of Miss Rodeo Wyoming twice. I have passed the age limit to be eligible to compete again. But I look back and smile when I think of the experiences I had. Although it was my ultimate dream to become Miss Rodeo Wyoming, I know that I tried my best. I dedicated years of my life to being a rodeo queen and I was always very focused on my goals. I have realized that God has a plan for us all and some things aren't meant to be. I am looking forward to barrel racing again, something that I had to put aside while fulfilling my queen duties. I took great pride in representing my state and the sport that I love. �I would encourage any young lady to enter a rodeo queen pageant. If you're serious about it, it's alot of hard work. But all the rewards are worth it! I have gained so much and grown as a person through my preparations and competitions. It was tremendous honor to represent and promote such a special sport, RODEO!